Calling all fake tan junkies and bronzed goddesses - this post is for you! Here's the brand new, new look range from Solait, with tanning mousses, sprays, bronzers, shimmery body oils and more! 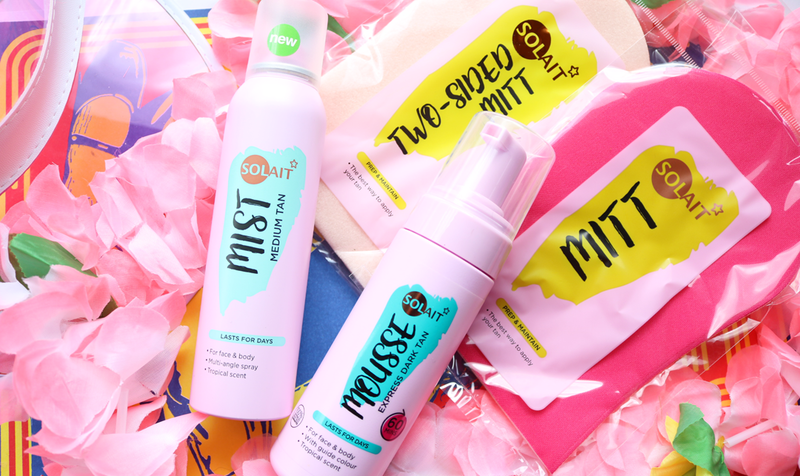 When it comes to affordable beauty shopping, you can't beat a good old trip to Superdrug. 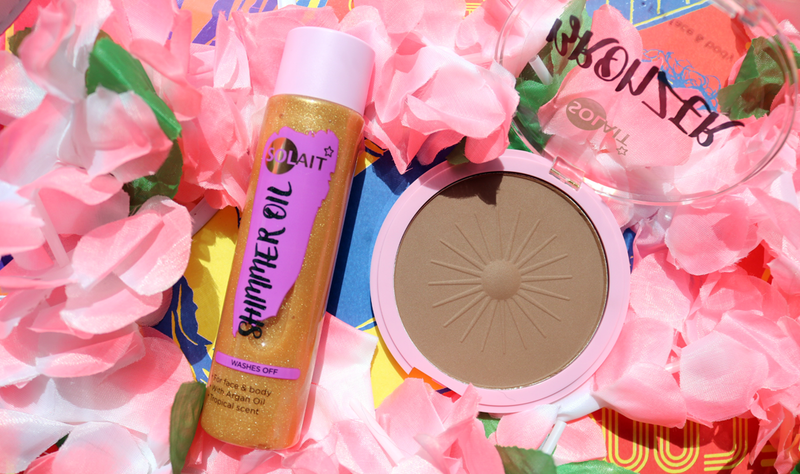 Their own-brand self-tanning / bronzing range Solait, has recently undergone a makeover and they've now launched a complete line to get you bronzed and beautiful for Summer. 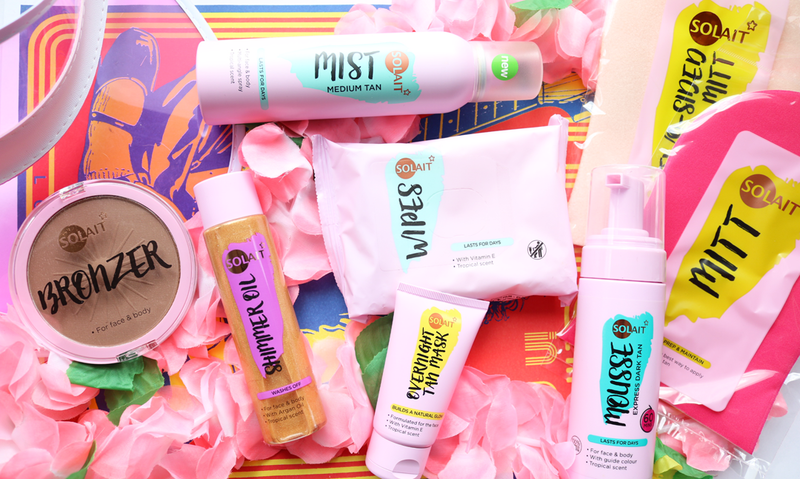 The whole range is certified cruelty-free and everything is also suitable for vegans, plus all of the products have a lovely tropical scent. Perhaps best of all though, there is nothing in this range that's over £5, so you can happily treat yourself and try something new without breaking the bank. Here are just some of the products available to give you a cheeky taster of what you can expect to find from Solait. One of the new releases is this tanning mist that has a rather nifty multi-angle spray so that you can easily get to all of those hard to reach areas. It comes out as a fine mist and then you can just buff it in to get a good even coverage with no streak issues. I find that this mist dries very quickly, so it's a good one to use if you're in a hurry! The tan starts to develop instantly, but it does need around 4-5 hours to get a lovely, medium, natural looking tan colour. I loved the overall shade of this and it lasted well for around 3-5 days. My only bugbear with this product is that when it starts to wear off, it goes incredibly patchy as it fades, so best to whip out the body scrub sooner rather than later. Mousses are my favourite way to get my tan on, and this one is one of my favourite budget fake tans, in fact, I think it's one of the best that you can pick up on the high street. It goes on so beautifully and develops very quickly, plus you can choose the level of darkness that you want to go by the hour e.g one hour for a light tan, two hours for a medium colour and three hours for the maximum darkest shade. I always leave this on for the full three hours, sometimes longer, and I absolutely love the colour. I get so many compliments from it - an amazing budget beauty find for less than a fiver! 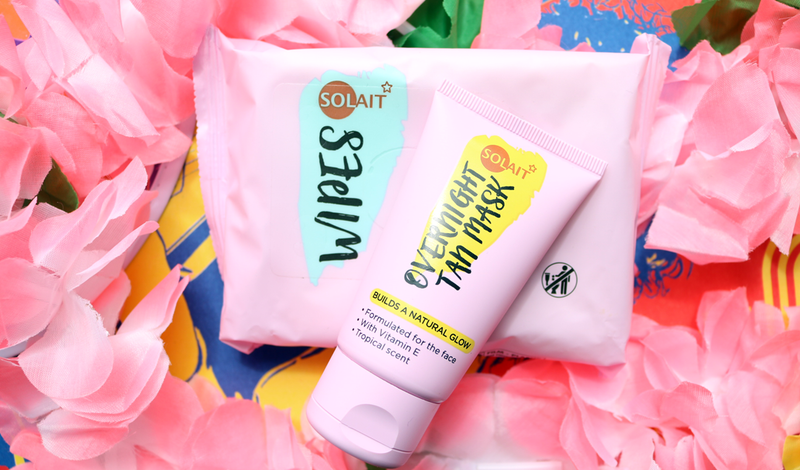 Solait have two tanning mitts in their range; a two-sided mitt (£4.99, link) and a regular tanning mitt (£3.49, link), but I wasn't impressed with either of them as they sometimes have a tendency to have lots of fluff bits coming off them when you're applying your tan - not a good look! I'd recommend sticking with brands like Velvotan, He-Shi and St. Tropez instead, who all have excellent tanning mitts that are around a similar price point anyway. For topping up your tan, these wipes are a genius idea and so easy to use. Just exfoliate and moisturise your skin before using them and then wipe them over the areas that you want to top up. I really like using these wipes on my legs if I'm wearing a dress or shorts to give a little bit more depth and colour to them, but they're great to use all over. Super handy for travelling with as well! Having used only high-end facial tanners from the likes of James Read, St. Tropez, He-Shi and Vita Liberata for such a long time, I wasn't expecting much from this budget overnight tan mask but I was pleasantly surprised. It feels like a normal facial moisturiser and you apply it before going to bed, leave it on overnight and rinse off in the morning. It develops into a natural looking light tan shade that gives such a lovely, healthy looking glow to the complexion. Small downside is that it's rather strongly scented which may put some people off, but I haven't experienced any breakout issues yet and I've been using it for over a month now. A touch of shimmer looks stunning in the sunshine and I've been really enjoying using this shimmer oil for a light and natural looking glow. Although it looks insanely glittery in the bottle, it actually goes on much more subtle once it's massaged into the skin, and gives a beautiful sheen to legs, arms and the decolletage without being OTT. Smells gorgeous and is a fab budget dupe for many of the pricier shimmer oils on the market. If you're a fan of using a pressed bronzing powder on your body, you'll know that you need a big pan to get a big brush in, and this one gives you a huge surface space to work with! You get 22g of product with this bad boy and the colour is a true dark brown/bronze with not a hint of orange in sight. Blends easily with a kabuki brush and is suitable for using on the face and body, though I tend to use this mainly on my body as it is quite dark.